As winter winds down and transitions into spring (or so we hope), MaRS’ Entrepreneurship Programs team is preparing to bring a series out of hibernation. After a short hiatus, the MaRS Startup Book Club is coming back, with a great lineup of books and dynamic facilitators that will be sure to generate a lively discussion. 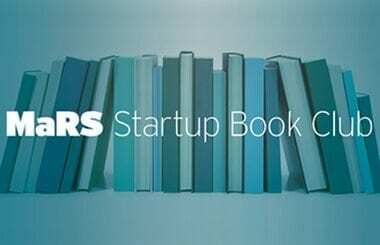 The MaRS Startup Book Club brings together entrepreneurs and members of the startup community to learn, connect and grow through discussions about books that highlight business fundamentals and the latest trends in the startup ecosystem. Whatever your dream or sacrifices, Tim Ferriss provides advice and step-by-step instructions on how to reassess your life, your time and your money. This book will be an eye-opener for many readers. Being adopted across the globe, The Lean Startup is an approach that changes the ways that companies are built and new products are launched. Rather than wasting time creating elaborate business plans, The Lean Startup offers entrepreneurs in companies of all sizes a way to test their vision continuously and to adapt and adjust before it’s too late. Dramatic changes in business have unearthed a major gap between traditional approaches to strategy and how the real world actually works. This book serves as a new strategy playbook based on updated assumptions about how the world works and it shows how some of the world’s most successful companies compete and win today. Janice Rudkowski, facilitator, MaRS Entrepreneurship Programs: Janice is a Facilitator of Entrepreneurship Toolkit Workshops at MaRS and operates Helianthus, a successful strategic marketing, branding and communications consulting practice in Toronto. With 20 years of experience in marketing, communications and sales across private, public and non-profit sectors, Janice has amassed a wealth of knowledge and insights from working in diverse industries, from technology, healthcare, retail and education to consumer packaged goods, toys and fashion. Having managed both global and local brands, she is passionate and curious about the intersection of technology and marketing, and she advises and educates entrepreneurs on how they can efficiently establish and build their brands with limited time and resources. An avid reader and life-long learner, Janice looks forward to moderating the MaRS Startup Book Club. Jacqueline (Jackie) Csonka-Peeren, facilitator, MaRS Entrepreneurship Programs: Past-president and CEO of Segasist Technologies, a Toronto medical software company, Jackie has over 20 years of experience leading advanced technology development and commercialization. Also an inventor, she designed the FID method of team-based inventive design to facilitate the creative process in others. Most recently, she formed DecisionModel Associates, which seeks to advance the growth and prosperity of small and medium enterprises by way of applying tools and expertise in strategic decision-making processes. Gina Leslie, manager, MaRS Entrepreneurship and Innovation Series: Before joining MaRS, Gina worked in the small business and startup space in a variety of roles, with a focus on business development, project management and communications. She recently completed her master of business administration at the Rotman School of Management. At the MaRS Startup Book Club’s noon-hour meetings, attendees will explore both the traditional and latest thinking on startup methodology, meet with fellow entrepreneurs and learn more about the MaRS network, while enjoying a light lunch. If you’re interested in exploring these topics with your peers in a small group setting, stay tuned! Registration will open in the coming week! We look forward to seeing you there!